“Night is real. Night is not an absence of light, but in fact, it is daytime that is a brief respite from the looming darknessâ€¦” – Guillermo del Toro,Â The Strain. The popular horror novel from directorÂ Guillermo del Toro and author Chuck Hogan is coming to FX Television on July 13, 2014. Horror News TV, the guys behind the Hannibal fan podcast and the American Horror Story fan podcast are set to discuss and review each episode for the first season of this exciting terror tale of vampires! There has never been a better time for Horror on television. The Strain promises to be one of the more frightening of the bunch. Showrunner Carton (Lost, Bates Motel) Cuse joins the authors, Guillermo del Toro and Chuck Hogan, in adapting the novels for the FX Network, the home of American Horror Story. 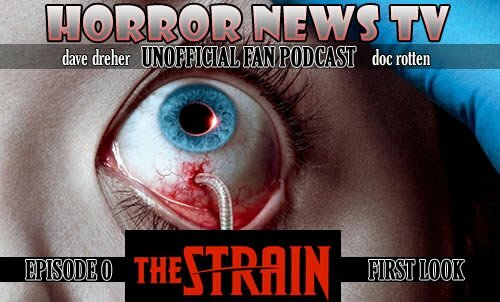 Doc Rotten and Dave Dreher from Horror News Radio and the Hannibal Fan Podcast dive into the information about the series, the cast and crew to get prepared for the first season of The Strain. Starting with Dr. Ephraim Goodweather (Corey Stoll) and including Professor Abraham Setrakian (David Bradley), Doc and Dave do their best to cover it all. As always we want your feedback so drop us a line at dave@horrornewstv.comÂ orÂ docrotten@horrornewstv.comÂ and weâ€™ll talk next week as we continue to bring you our recipe for fear withÂ HORROR NEWS TV THE STRAIN FAN PODCAST.